Mike and Brenda Harkins, Owners and Strategic-Partners of PrideStaff’s Fort Worth office, are proud to announce that theirs is one of only four offices in the nation to receive the 5 Star Award for performance in 2015 from PrideStaff, Inc., a national staffing organization. We are proud of the service and financial performance of the Fort Worth office, and we are pleased to award them this well-deserved honor. Honoring new offices with outstanding revenue growth during their first six months of operation, the 5 Star Award was presented at the PrideStaff Annual Conference in Phoenix, AZ. Each year, PrideStaff Strategic-Partners from across the country meet at the conference to share results and best practices, learn from world-renowned speakers, and improve their proficiency in owning and operating a full-service staffing firm. "Our goal at PrideStaff is to provide each Strategic-Partner with the tools and resources to build a successful staffing operation," said PrideStaff COO Tammi Heaton. "By leveraging the support we provide, and delivering exceptional, personal attention to clients and candidates, the Fort Worth office has started off strong. We are proud of the service and financial performance of the Fort Worth office, and we are pleased to award them this well-deserved honor." For more information about PrideStaff and its services, go to http://www.pridestaff.com. 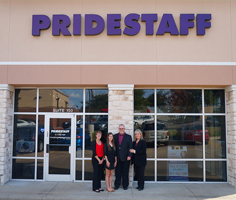 PrideStaff was founded in the 1970s as 100 percent company-owned units and began staffing franchising in 1995. They operate over 74 offices in North America to serve over 4,500 clients. With over 40 years in the staffing business, headquartered in Fresno, CA, PrideStaff offers the resources and expertise of a national firm with the spirit, dedication and personal service of smaller, entrepreneurial firms. PrideStaff is the only commercial staffing firm in the U.S. with over $100 million in revenue to earn Inavero’s prestigious Best of Staffing Diamond Award for three years in a row highlighting exceptional client and talent service quality.